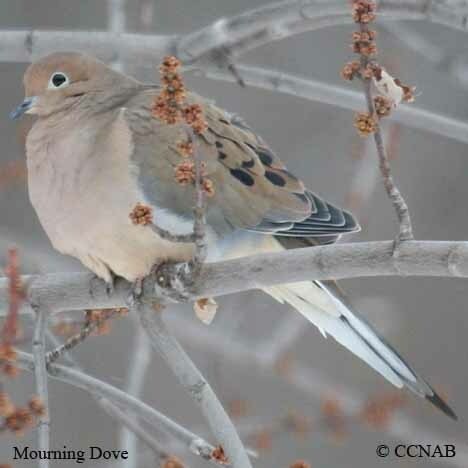 Species; The Mourning Dove (Zenaida macroura), is a commonly seen dove, found on over two thirds of North America Continent. Identified by it long pointy tail and wings, and what appears to be a small head. 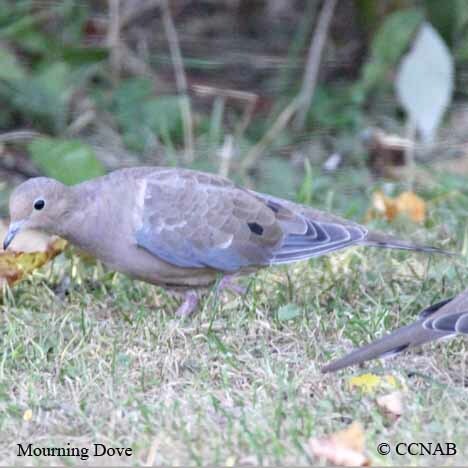 This dove is a regular visitor to the backyard feeders, seen feeding, both on the ground under bird feeders, or on platform feeders, where it has proper footing. Prefers open country, not a forest bird. 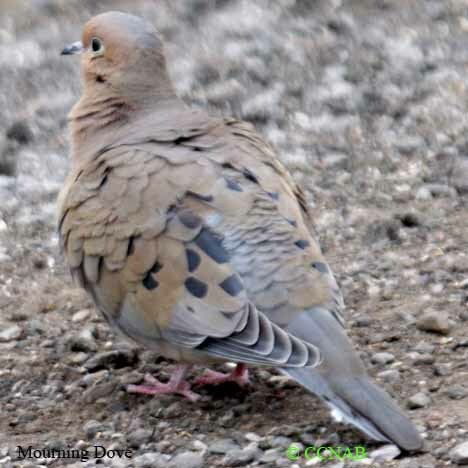 Is considered a gamebird in many US states. Harvested in the high millions every year, population does not seem threatened. 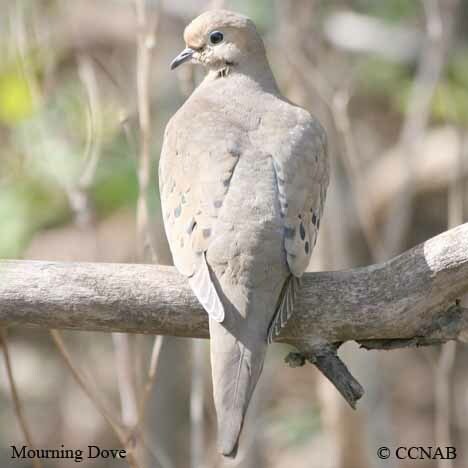 Protected in other states and in Canada, preserved as a song bird. Distinctions; Male and females are similar, with little apparent difference. 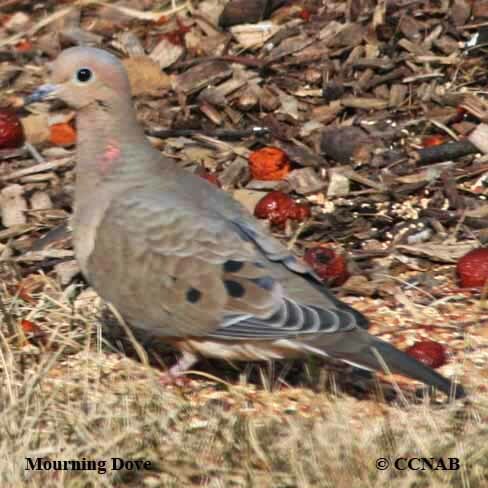 Male has iridescent blue and pink showing on nape of neck, iridescent pink on side of neck, clear black line, located at the base of lower cheeks, blue orbital eye ring, individual black markings on coverts and tertials, white tips on out tail feathers, darker primaries and secondaries, when seen in flight, has a light grey, buffy under body, darker grayish brown upper body, red feet. Female is similar to male, iridescent not as evidence. Juvenile appears scaly, darker tone. 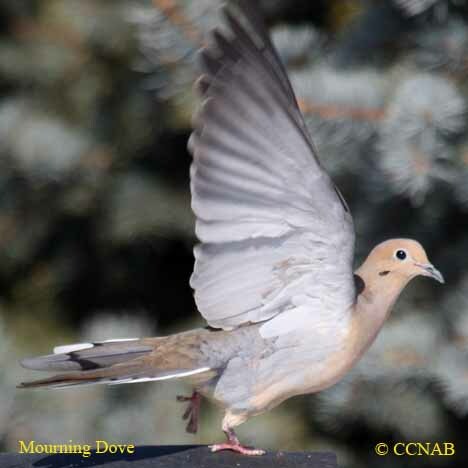 Voice; Males calls out through the seasons, vocal sound like oowoo-woo-woo. Nesting; Two to three white eggs, multiple broods per year, higher reproduction in southern regions. Nest built in shrubs, hedges and trees. Built from available materials, twigs and grasses. Distribution; Common summer breeders from Nova Scotia, west, through all the southern regions of the Canadian provinces to British Columbia. Year around breeder through most of the US states, except an area of the northern mid-west, from California to Florida, with an apparent likness to the warmer climates. Seen throughout the Mexican landscapes, does prefer an open country setting, and many of the Caribbean Islands.